Yes, really, really different! Alert (and lovely) blogger Alicia Chenaux got a peek Wednesday at the new experimental game sims on the Second Life grid, and thanks to Bryn Oh (there we are, below) I had a chance to pay them a visit last night. And this, my friends, is something unlike anything we've seen in Second Life. There's no sense that you're not in Second Life, but there's also no question that you're in a game, in a completely different kind of environment. Here's what happens. 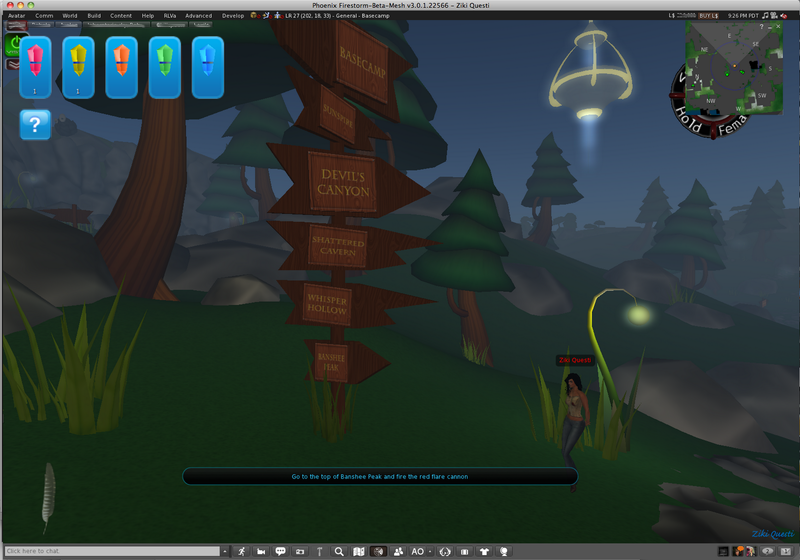 You teleport in from a Linden sandbox location, and you arrive at a sim called LR 28. (At least I did—I notice on the map that there are three identical groups of 12 sims, all set up to play the game, so maybe you'll end up in one of the others.) (LR? There isn't any other information, but I'm guessing it stands for Linden Research.) [Edit: It's Linden Realms.] You're automatically fitted with a HUD—it simply appears on your screen, as shown on the screen shot in the top photo (click to zoom in)—that gives you a goal or task (the instruction bar running across the bottom of the screen) and some crystals on the top left. Your first task is going to be getting to the workshop at the basecamp, and the fun begins right away because there are rock monsters that will try to catch you, and they're fast. There's a picture of one at the bottom of the blog post. You can outrun them, but you have to move quickly and constantly. (If you get caught, you get dumped at a safe spot from which you begin again.) There are wayfinding signs here and there, and eventually you'll reach the workshop, shown below—I'm there with Patti Daviau. After you reach the workshop, you'll be given the task of gathering crystals, building a flare, finding a mountain peak, and setting off a cannon. As you gather crystals the totals are shown on the upper left of your screen. (Below, Bryn, Patti and I are at the cannon, just as Bryn set off her flare.) That's as far as I got, after maybe an hour or two. I really have no sense of how much time I spent, but it was immersive, addicting, and, we all agreed, very well done. This place is a ton of fun. It's also remarkably free of lag, even when running full tilt from sim to sim, although there weren't many people there when I visited. The implications of this experiment are significant—I can imagine some amazing games being developed using the toolset that the Lab is assembling for this project. Update: I forgot to mention that the game is designed to provide rewards as you reach certain goals. If you manage to get your red flare to shoot off the cannon, for example, you get paid L$1 (woo woo! lol) and get a link to the SL Marketplace. And ... the game saves your current status, so you can return and pick up where you left off. I was *almost* tempted to sign-up as premium once more to try this out. Cannot wait until it comes out of "beta". Which apparently might be a while from what Rodvik has said. Hmmmm. Well, now I'm stuck, cos my HUD stopped giving me directions, no matter what I do, and there doesn't seem to be any way to reset it. ;( Still, this shows great promise.